To see an example of what’s covered on the course, watch the lesson excerpt or listen to the track from the course, both of which are embedded below. In this opening module, Rob auditions and imports the stems, then works out the original BPM of the track, before editing and organising the project to create the basic building blocks from which the remix is made. This module starts by making a simple beat, to which various melodic, looped stems are added. These are then analysed and used to work out the key of the song, as well as its groove, from which a bassline is made. In this lesson, Rob continues working with some of the melodic stems, adjusting clip envelopes and applying various effects, to help shape them into workable parts for the track. Rob begins this lesson by sampling the main organ from the original track and using it to sequence a new melodic phrase, which forms the main motif in the remix. 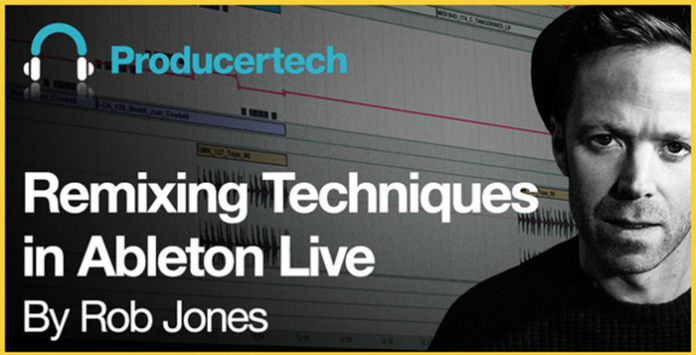 After this, he shows how a looped percussion sample can be recreated using various Drum Rack techniques. This set of 3 lessons sees Rob creating the arrangement, starting off by putting it together in realtime and then ending with a walkthrough of the final layout.